One reason I like to go to the trouble of making my own canned food is so I know what goes into the jar. 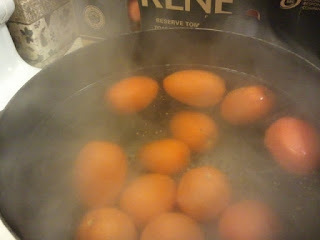 I hate opening a can of store bought tomatoes and finding skins floating in the can. The big processors can't possibly get them all. 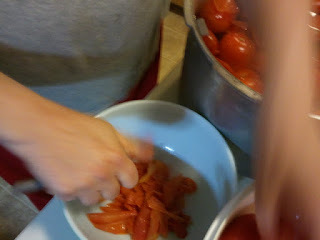 At home I am my own quality control and can ensure there are no skins in the tomatoes. 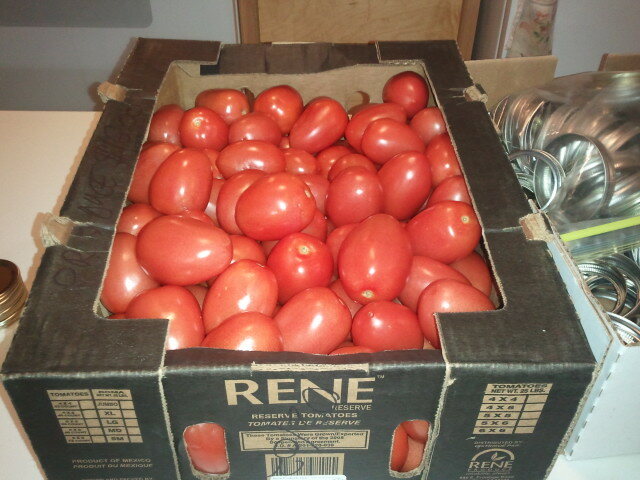 It takes me about 30 minutes to skin 20 pounds of tomatoes after I have everything set up. This process is used for any of the home canned tomato foods I make. Sauce, diced, whole, salsa, spaghetti sauce, etc. 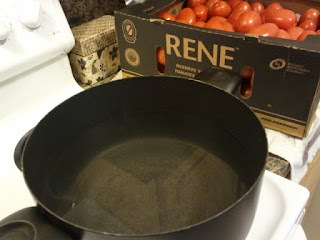 Fill your large cooking pot 2/3 full of water and put on stove to bring to a boil. While you are waiting on the water to boil set up your work area. You will want to everything close and conveniently arranged to make the process go faster and smoother. I set up a long folding table in the center of the kitchen so all I have to do is turn around while blanching. 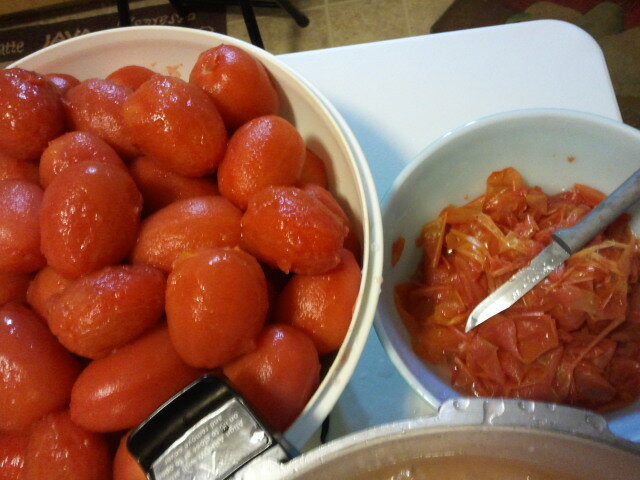 Once the blanching is done I can sit to skin the tomatoes. I use a stool that is just shorter than the table so I am not reaching or bending. This work can get very hard on your back and feet. Half fill one of the large containers with water and add about a quarter of the ice. 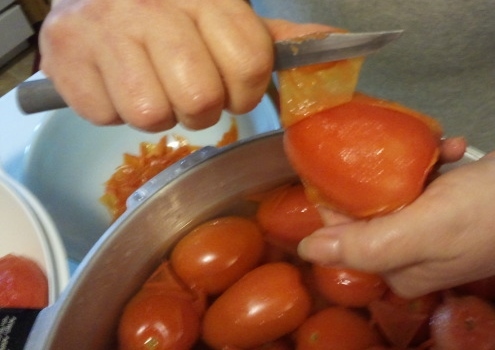 Place another large container nearby with a smaller container and a paring knife. Once the water is boiling drop up to 12 tomatoes into the pot. 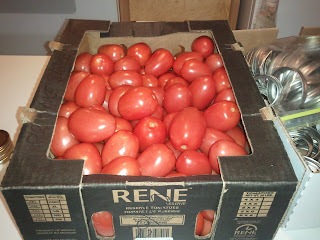 I have the tomatoes to the right of stove. I hold a slotted spoon in my left hand then use my right to place a tomato into the spoon which slides it into the boiling water. 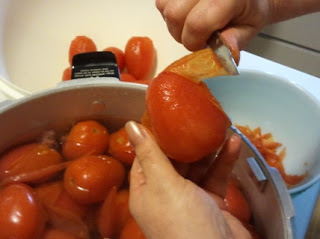 As soon as you see the skin crack use the slotted spoon to lift the tomato out and place it in the colander. 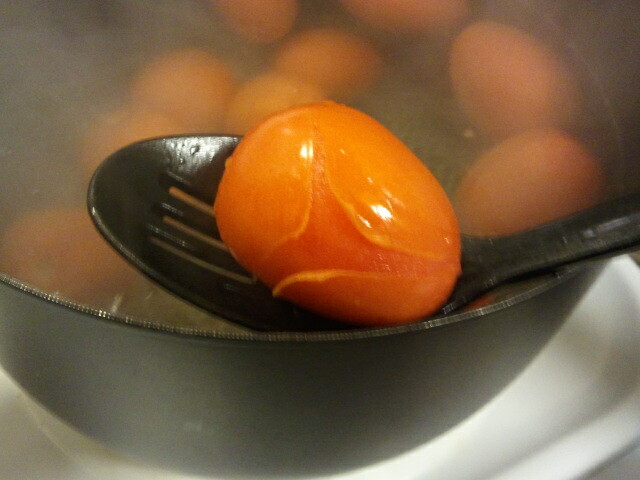 Don't leave the tomatoes in the boiling water for more than 2 minutes. They begin to cook and get mushy. Don't worry if the skins don't crack. 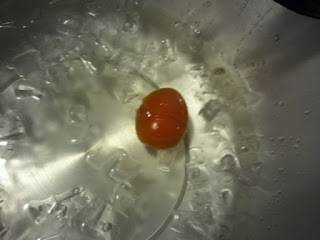 Drop the tomatoes in the colander into the large container filled with ice water. I was working with 20 pounds of tomatoes and continued this process until approximately half were blanched. 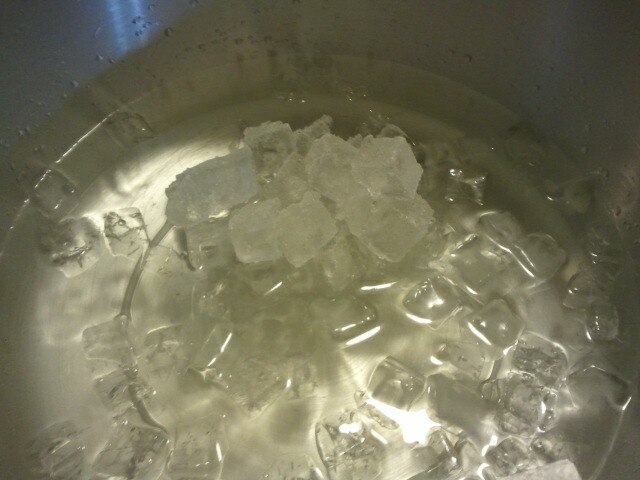 Add more ice as needed. 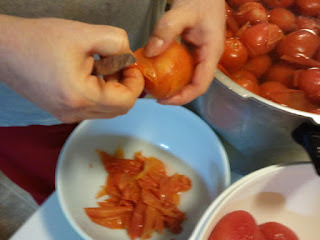 Holding the paring knife in my right hand I grab a tomato from the ice water to my left. (Reverse for left handed people.) The skin will usually slide off and I mostly use the knife for a grip. If the skin did not crack pierce the tomato at the bottom and the skin will come off. Use the paring knife to grip any parts of the skin that are stubborn and don't slide off. I forgot the gloves through these steps wanting to make sure I got photos. I don't worry about the stem end at this point. Just focus on getting the skins off. 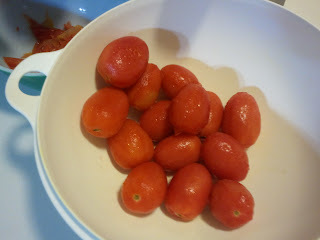 You now have peeled tomatoes ready to be made into whatever you desire.